We had lots of private celebrations this weekend at Pheasant Field B&B! Two couples spent their wedding night at Pheasant Field. We wish all the best to Adam & Deanna and Manny & Samantha as they begin their new lives together. Kari & Jim were here to celebrate their first anniversary! Their pups came along with them and even enjoyed some of the anniversary/wedding cake. Now that will be really good luck for them! Joe & Ellen were celebrating 36 years of marriage. They enjoyed meeting the newly weds. Joe & Ellen are frequent guests and usually come here for the Corvette show. We were happy to have them here to visit other attractions in the area. They had a great time at the Oktoberfest at the Army Heritage & Education Center. There was also a birthday celebration - Three sisters get together here several times per year. This trip included a birthday cake for Janice. They also found lots of things to see and do. Shopping was one of the favorite activities for them this weekend. They told me about a book store that I never visited - Canaday's Book Barn- which is conveniently on the way to Meadowbrooke Gourds! That will make a nice afternoon of browsing for almost anyone! We had a wonderful weekend doing our best to make all these guests feel special in some small way during their celebratory getaway. Next weekend, come for the special literary event, Celebrate the Book - a benefit for our local library. 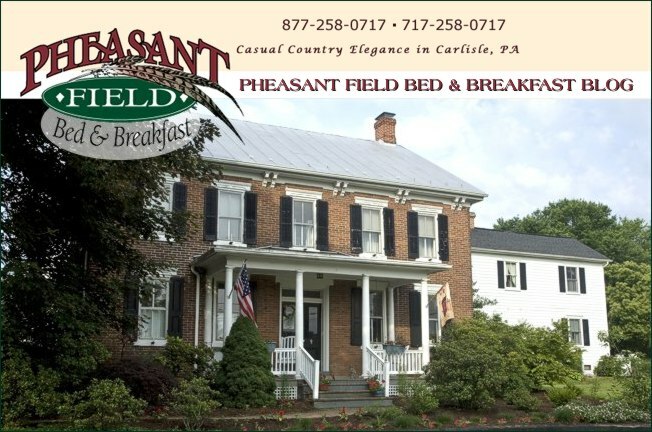 Check our availability and plan your fall getaway to Pheasant Field B&B.